Jones was released at the end of last season by Walsall after two years although during the latter part of last season he was on loan at Motherwell. He'd been with the SPL club from January onwards and made his farewell appearance in the Scottish Cup Final against Celtic. It's five years since he signed for Burnley. He had a decent start and end to his first season at Turf Moor but fell out of favour and hardly featured in the next two seasons, some of which were spent out on loan at Huddersfield and Bradford City. He was released at the end of the 2008/09 season and signed his two year deal with Walsall. 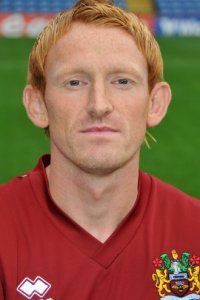 Now, aged, 34 he's been looking for a new club and is currently on trial with Newport County who ended last season in 9th place in the Blue Square Premier League. Jones has impressed manager Anthony Hudson since joining up with Newport. He'll play tomorrow in a friendly against Cheltenham Town and it looks very likely that he is set to be offered a contract with Newport for the coming season.